Press Room Automation & Feed Fixtures Pvt. 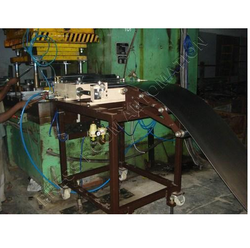 Ltd. manufactures automatic lines for circle cutting from coil with the aim of reducing the scrap quantity by exploiting the whole width of the coil. The technologyused by Press Room is shifting of the coil below a xed die. It is characterised by a good production capacity, high exibility and low tooling costs. 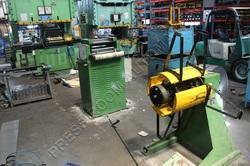 Line consists of decoiler with coil car, straightener, nc zig zag feeder, press, shear & stacker. Entire working sequence isdirectly managed from Control Panel which allows operator to have a single control of all the line functions. The strip from the coil can have two movements, both NC servo controlled: the feeding movement (called longitudinal shifting) & the lateral movement (called transversal shifting). Thanks to these movements, each blanking is followed by the lateral movement of the coil of a programmed step and by the blanking of the next disk, up to the realisation of a row of blanked disks along the coil width. At the completion of the row, the strip is fed so that the blanking of a new row can start. Press Room has designed special programme which automatically calculates position depending on stock width & circle diameter. Saving atleast 5 to 8% in material cost. Good Production & High Flexibility. The program allows optimizing the material use, minimizing trimmings line functions. The programme shows ideal width for the given no. of rows & circle diameter. Allow angle change function to accomodate higher no. of rows. Zig Zag Servo Feeder for 400 mm Width & 3 mm Thk is used for blanking Clutch Plate, Automotive Disc Brakes, LPG Cylinder, etc. 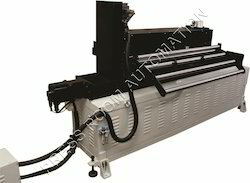 Press Room Automation has designed circle cutting line with 1300 mm width & 1.2 mm Thk Zig Zag Servo Feeder with following features. It is designed for blanking out circles, in zig-zag pattern to perform from two to multiple rows / pattern typically. The soft ware can do both S or W pattern depending on the application. The Control Panel is designed with special programme, which automatically calculates position depending on stock width & circle diameter. The programme allows optimizing the material use, minimizing trimmings line functions & saving at least 8% in material cost. Special angle change function results in accommodation of higher no. of rows for the given width. The software gives ideal width & max yield for the given no. of rows & circle diameter. Servo Motor, Drive, PLC & HMI Package All from Mitsubishi, Japan. 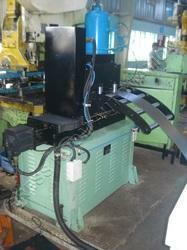 Entire line consists of Decoiler with coil car, NC Zig-Zag Servo Feeder, Press , Shear, Stacker, etc. can be supplied. 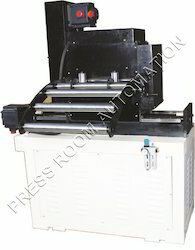 We are one of the leading manufacturers and supplier of Light Series NC Servo Feeder. We obligated to meet the quality standards as per the customer demand. Picture showing Zig Zag Feeder mounting on Press. 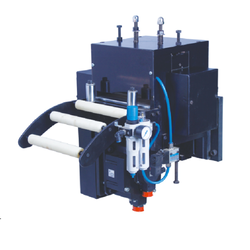 We are one of the leading manufacturer and supplier of Heavy Duty Pneumatic Feeder. We obligated to meet the quality standards as per the customer demand. Looking for Zig Zag Servo Feeder ?